In addition to the cross-sectional surveys, there are several longitudinal studies that track the same person, family, or household over time. Because of the challenges and costs involved in tracking respondents, these surveys typically involve much smaller samples than cross-sectional studies and are often much more focused on specific populations and/or topics. Some of these surveys, such as the Survey of Income and Program Participation (SIPP) or the Medical Expenditure Panel Survey (MEPS), track people or households for only a few years. There are also two well-known, long-term longitudinal studies to consider: the Panel Study of Income Dynamics (PSID), begun in 1960, and the National Longitudinal Survey of Labor Market Experiences (NLS). Longitudinal studies offer many of the same potential advantages as cross-sectional studies, and they have the added potential benefit of tracking people over time and thus may provide an opportunity to examine entries into, and exits out of, homelessness (depending on their tracking methods). However, as discussed in a later section, the longitudinal studies are smaller in overall sample size and lack the ability offered by cross-sectional studies to examine regional differences as well as various subgroups. Table 6-3 presents a summary of the eight longitudinal surveys that were identified and reviewed for this effort according to the same features used to review the cross-sectional surveys.9 As with the cross-sectional surveys, the longitudinal surveys were initially examined according to four key selection criteria to identify surveys that offer the best opportunity to be enhanced to inform efforts to develop a typology of homeless families. Six of the eight surveys were deemed inappropriate candidates for enhancement, as discussed later. Only two surveys-the NLS 1979 cohort study and the NLS 1997 cohort study-met all four of the initial criteria. As noted in Chapter 2, existing studies, including the NLS and ACS, do not provide enough information to identify families that are currently or have recently been homeless. The major enhancements that these surveys need include adding questions and/or adding response categories that make it possible to identify homeless families. American Community Survey. Enhancements of the ACS would focus on the housing section of the survey. These enhancements would include questions to determine whether household members are currently living in some sort of emergency or transitional housing, and whether they have been homeless or at risk of being homeless in the past 12 months. Also proposed is a question on whether anyone in the household has a housing subsidy. Table 6-4 shows in which sections of the survey instrument those enhancements could be made. * These are modified versions of questions asked in the Fragile Family Study. National Longitudinal Surveys of Youth 1997. The NLSY97 already collects housing and mobility information. In fact, the NLSY97 uses a set of responses to describe the respondent's current living situation that already includes "Shelter (for homeless or abused) or on street…" It then follows up with a question concerning how long the person has been living in this place. The NLS97 also includes a number of questions about various risk and protective factors. Many of these questions, including such topics as illegal drug use, criminal behavior, and arrests, are asked as part of an ACASI section. What is not collected in the NLS97 survey is whether the respondent was homeless at some point between the current and previous interviews for those who moved, and whether the respondent was ever at risk of being homeless. Finally, depending on the length of time it takes to add any of these questions into the NLS, it may also be necessary to include homeless history questions at least once. Table 6-5 shows possible enhancements in the NLSY97. History of Homelessness: It may be possible to determine whether current respondents were ever homeless and to link that information to NLS data that have already been collected. Lived with others due to cost? Lived in places not intended for habitation? Lived in an emergency shelter? Lived on the streets (including car, campsite)? * These are modified versions of questions asked in the Fragile Families Study. 7 The surveys examined in this chapter were identified using a variety of sources. In addition to the surveys identified and examined in Chapter 2 and recommendations made by members of an Expert Panel brought together in July 2005 [see Chapter 3], surveys were identified through various web searches. Summaries and lists of databases, such as the list of public databases maintained by the American Sociological Association were also reviewed. Two recent government reports were also reviewed that discussed similar recent efforts at examining various Federal surveys to make more efficient use of these data collection sources. 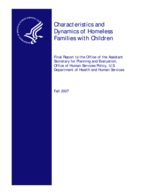 One was an inventory of Federal databases conducted for the HHS Office of the Assistant Secretary for Planning and Evaluation, as part of an assessment of major Federal databases for analyses of Latinos and Asian or Pacific Islander subgroups and Native Americans (Waksberg, Levine, and Marker, 2000). The second was a more recent review of Federal health surveys sponsored by The Robert Wood Johnson Foundation and the CDC's National Center for Health Statistics (AcademyHealth 2004). 8 In order to protect the confidentiality of their locations, group quarters will not include domestic violence shelters. 9 Since the NLS79 and NLS97 studies collect information on two distinct cohorts of households, and even use different data collection. 10 These numbers are from the PSID Guide available online at: http://psidonline.isr.umich.edu/Guide/ug/chap5.html. 11 Only 3 percent of the initial NLSY97 interviews were done over the telephone, for example, compared to 8.7 percent of the interviews in 2000.